The company is introducing a successor to the Nokia 130. Last year Microsoft released the Nokia 130, a basic mobile phone that was quite affordable and simple to use. 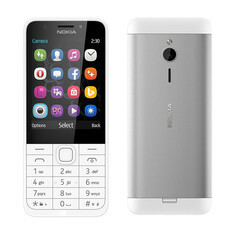 Today, the company has announced the next iteration, the Nokia 230, is going to be released sometime in the near future. The most noticeable difference appearance-wise of the 230 as compared to the 130 is its aluminum back which should provide some extra protection and even make it seem like a more premium offering. In terms of specs, the mobile phone will have a 2.8 inch display with 320x240 resolution and expandable storage up to 32GB. The device will release with rear-facing and front-facing cameras that are 2MP. Talk time is 23 hours according to Microsoft, and the long-lasting battery is definitely something not seen often with smartphones. Interestingly, Microsoft will also be selling a dual-SIM model of the 230 for those who need to make use of more than one phone but do not want to incur the cost of buying another. While the specs may not seem outstanding, it is important to remember that this is meant as an extremely affordable offering and the price tag reflects just that. The 230 will cost $55, which is much less than some of the premium smartphones on sale today. Those in India, the Middle East, and Asia will be able to buy this phone in December, but all other regions will not be able to until sometime in 2016.